In print: [Feynman2011]. I like to relate them to literature on presentation design, e.g., Made to Stick [Heath2007] and the SUCCESs paradigm (cf. Notes on Made to Stick). This is his core idea, the take-home message. This reminds me of the "Simple" paradigm in SUCCESs (cf. Notes on Made to Stick). Each step of the lecture is a phase with one theme. It establishes an idea or a step in an argument. The phase has a length of less than 10 minutes, which allows to re-grab the audience attention at proper times (cf. Notes on Medina's Brain Rules, Rule #4). Feynman introduces the theme of the phase and the concepts needed. Feynman motivates each phase with one question to answer, e.g., how does the two-hole experiment work with electrons. It's a question that intrigued the scientists, e.g., "Now that we know how the earth revolves around the sun, what makes it move that way?" Also, he lays the ground for the next question. Feynman uses the last part of his lecture to make a strong statement. It summarizes the most important insights (Remember to Repeat, cf. Notes on Medina's Brain Rules, Rule #6). He uses some very well-chosen sentences to drive his message home. He uses analogy and vivid language, a metapher, a story to close - not just dry facts. (They acquire the last bit of material best). Feynman makes one point at a time and structures the points with first, second, etc. Example: "First, what you hear in the electron detectors is 'clicks', electrons come in lumps." Feynman tells his story in very concrete terms. He avoids technical language, whenever possible. He uses anologies and contrast, even for the most incomprehensible and abstract parts of quantum mechanics. 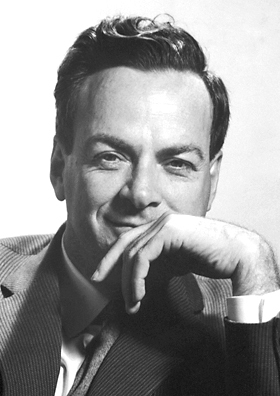 Feynman builds up an argument to solicit surprise, for instance, when he shows the interference pattern of electrons. And, he uses a dramatic pause to let the surprise sink in. Feynman uses drawings whenever possible (Picture superiority effect!, cf. Notes on Medina's Brain Rules, Rule #10). He develops the drawings step by step, unfolds the argument with the drawings. Feynman just uses simple-most drawings, by hand with one color. This conveys the idea in simplicity and essence. He imitates real-world experiments, shows physical processes (e.g., doulbe-slit experiment). In the lecture about symmetry, Feynman starts several sections in a row with "I give you another example". Feynman uses a lot of examples and anologies, e.g., comparing physics with watching a game of chess. The use of examples makes it concrete as well as very detailed and thereby credible (SUCCESs, again, cf. Notes on Made to Stick). He usually starts with the easiest to understand example (e.g., law of electric charge in conservation laws). Feynman makes his examples lively, for instance, say a lightning hits there and we get a electric charge. The example is expressed in a language of the senses, seeing, hearing, smelling even. Feynman does not replace an abstract concept with an abstract example, but makes it utterly concrete (even when it comes to quantum effects). Feynman uses a separate board for formulas/tables than for drawings. The audience can always see both. The structure gives the audience a sense of orientation. Speech of the pompous philosopher. The use of voice makes his talk very lively (SUCCESs, emotional, cf. Notes on Made to Stick), but also re-grabs attention. Feynman uses acting as well, e.g., in which, he plays out how to look at the electrons passing through holes. [Feynman2011] Richard P. Feynman, Robert B. Leighton and Matthew Sands. The Feynman Lectures on Physics, The New Millennium Edition. Basic Books, pp. 1552, ISBN: 9780465023820, January 2011.